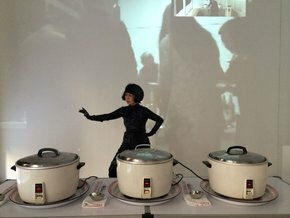 Throughout her performances, France-based Taiwanese artist Bonnie Tchien Hwen-Ying conveys her legacies resulting from this two-fold cultural substance. She embraces ancestral Chinese rituals of Tai-Chi, martial arts and traditional dances, which she conceptualizes and reinterprets in a contemporary fashion. This duality brands the very essence of her artistic approche where revisited costumes and make-up meet with glorified accessories, thus creating her own style and vocabulary to redefine symbolic figures anew. Chinese opera is given a choreographie dance twist and transformed into an utterly dramaturgical act in which the artist, like an alchemist in search of the philosopher’s stone, morphs her body by means of inspired and motivated gestural. Amidst this meditation and introspection, with drawn in her own world she delivers the upmost expression of her art and captures the crowd in her wide-awake dream. As a contestation figure of the “Golden Lotus” martyrs, she puts herself through intense imbalance on top of surrealistic high-heels all the while she forces upon us an equilibrium of Yin and Yang. Here, all is absence of time and void of space, the highest state of meditation.